MageMount and MageMount II are rail-less solar mounting systems that are installed like rail-based solar mounting systems with separate roof attachments and interlocking module connectors. They provide complete solar mounting solutions with roof attachments for all types of sloped roofs at lower cost and reduced installation time with familiar and fewer components. The systems are designed with focus on easing installation and reducing installation time and cost. MageMount rail-less solar mounting system can be installed with solar modules compatible with MageFrame. MageMount II rail-less solar mounting system can be installed with most of regular solar modules. 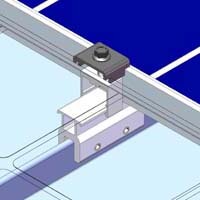 MageMount II is a rail-less solar mounting system that is installed like a rail-based solar mounting system with separate roof attachments and interlocking module connectors. It provides a complete solar mounting solution with roof attachments for all types of sloped roofs at lower cost and reduced installation time with familiar and fewer components. It doesn't require rails or clamps and is designed with focus on easing installation and reducing installation time and cost. MageMount II rail-less solar mounting system can be installed with most regular solar modules available in the market. MageMount is a rail-less solar mounting system that is installed like a rail-based solar mounting system with separate roof attachments and interlocking module connectors. It provides a complete solar mounting solution with roof attachments for all types of sloped roofs at lower cost and reduced installation time with familiar and fewer components. 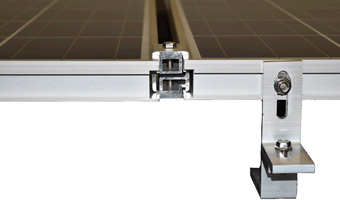 The system doesn’t require rails or clamps, and utilizes solar module that comes with MageFrame designed by Magerack. It is designed with focus on easing installation and reducing installation time and cost. MageMount rail-less solar mounting system can be installed with solar modules compatible with MageFrame. Standing Seam Metal Roof Mounting Kit is rail-less solar mounting system that is use to install solar modules on standing seam metal roof. It provides solar mounting solution with roof attachments for standing seam metal roof without using rails at lower cost and can be installed at reduced installation time with familiar and fewer components. It has only two parts, Mid Clamp Kit and Universal End Clamp Kit. They are compatible with most solar modules. 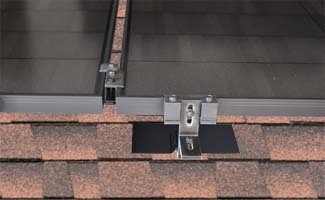 The system is designed with focus on easing installation and reducing installation time and cost.